For the sauce, melt the butter in a saucepan over a medium heat. Add the mushrooms and onion and cook for 3-4 minutes. Add the garlic and cook for one minute longer. Sprinkle in the flour and cook for 1-2 minutes until lightly browned, stirring vigorously as it cooks. Gradually whisk in the milk and cook for 2-3 minutes, whisking constantly, until slightly thickened. Stir in the basil, oregano and nutmeg, if using, and cook for one minute. Season to taste and set aside. Bring a large pot of salted water to a boil and cook the lasagna sheets according to the package instructions. Drain and rinse under cool water. Spread one-third of the mushroom sauce into the bottom of a 20cm baking dish. Cover with lasagne sheets, breaking to fit if necessary, then layer over half of the Ricotta, half of the spinach and 60g of the Mozzarella. Repeat with a second layer. 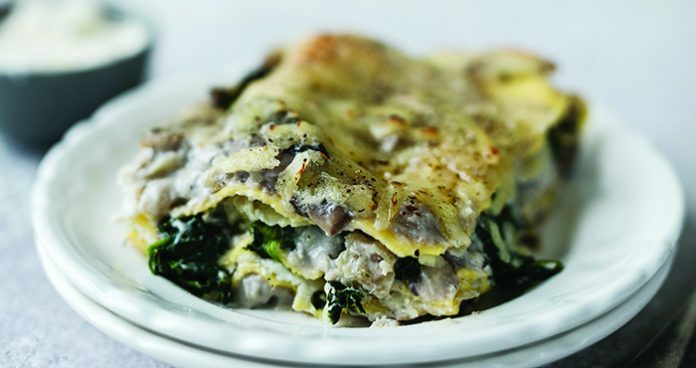 Top with the remaining lasagne sheets, mushroom sauce and Mozzarella, then sprinkle over the Parmesan or vegetarian hard cheese. 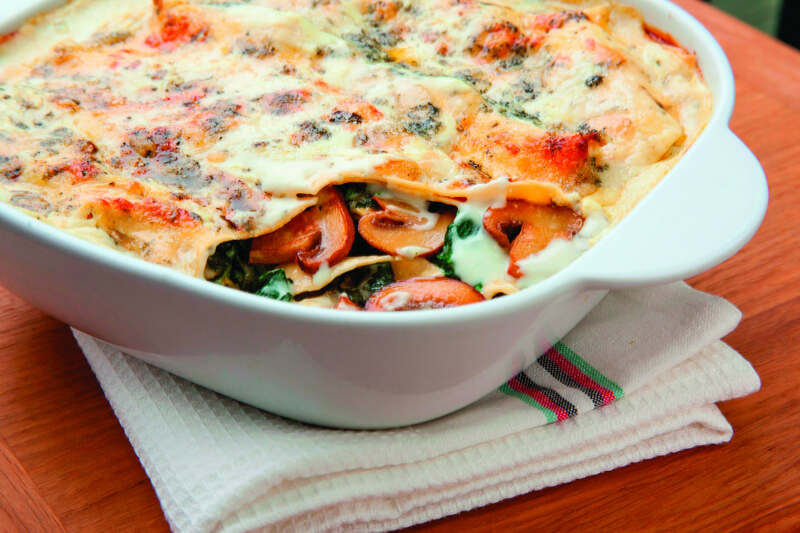 Bake for 25-30 minutes or until the lasagne is golden on top and bubbling around the edges. Allow to stand for 10 minutes before slicing and serving.